This is a fine old riverside town, partly in Suffolk and partly in Essex. The same was once true of nearby Sudbury, but the Ballingdon district there was drawn into Suffolk by boundary changes in the 1950s. Tradition survives here, and this is still a split town. The Essex side is called Bures Hamlet, but is now the larger part, with a railway station and housing estates. The River Stour is the border, and it flows not far from the western edge of the churchyard. 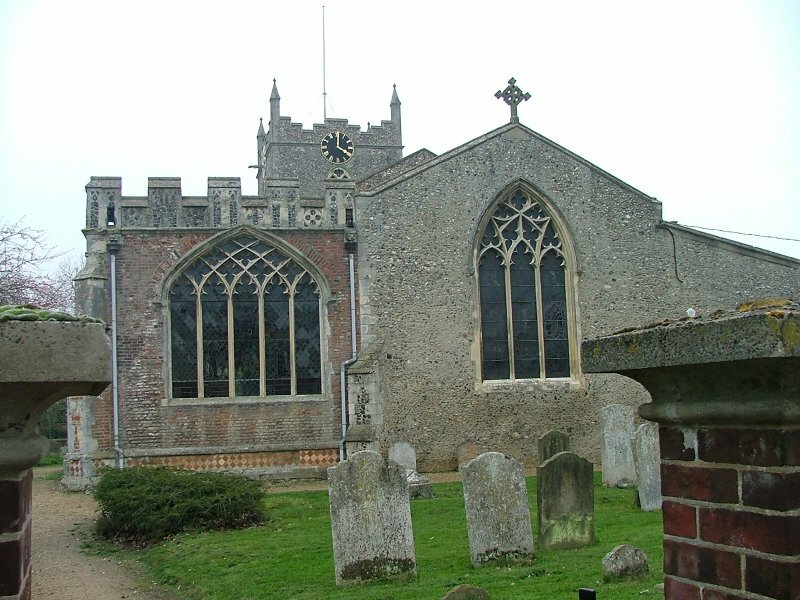 The Suffolk side styles itself Bures St Mary; however, this church was never dedicated to St Mary until the 19th century Anglican revival, when one of the results of the Oxford Movement was a renewed interest in church dedications. 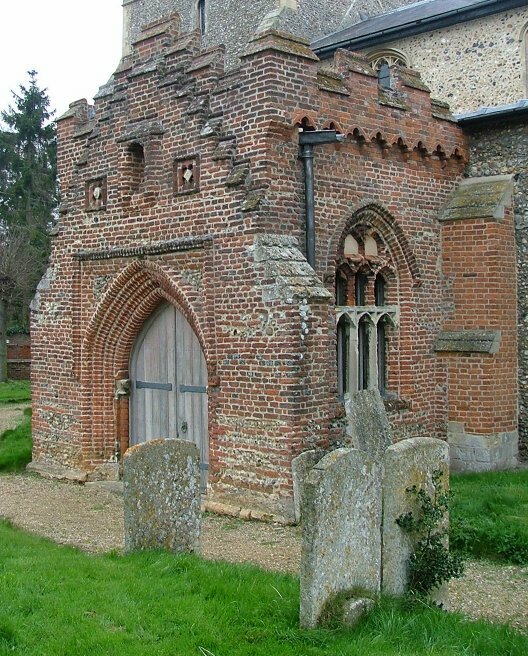 The confusion arose because of a now-vanished chapel in the churchyard dedicated to the Assumption of the Blessed Virgin. In fact, the dedication of this church in medieval times was probably to the feast of All Saints. You can enter the church through either the north or the south porches, but both are lovely. 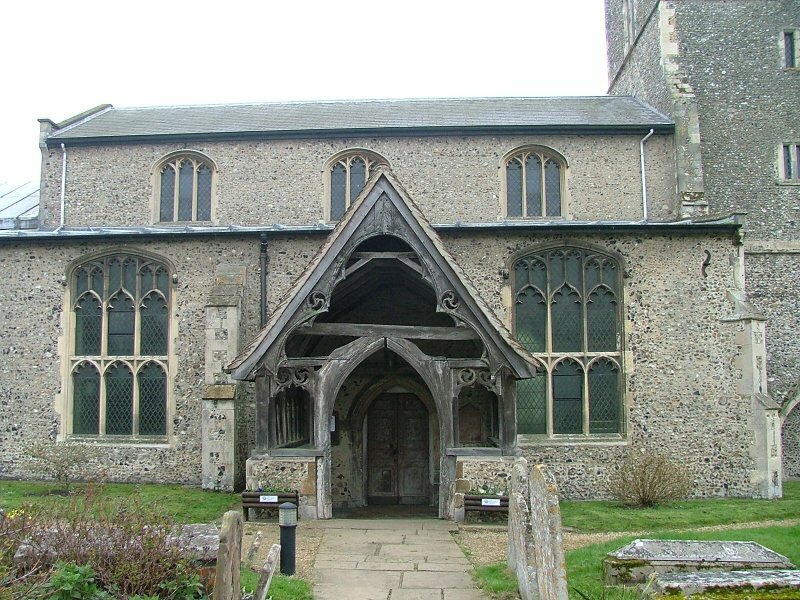 The red brick early 16th century south porch in particular is stately and grand, with its fine holy water stoup with supporting figures, and wide open space suited for the conduct of parish business. There is a fearsome exterior headstop low on the west side, which must surely be older than the porch - 13th century, I should think. Either the Tudors reused it, or the Victorians placed it here during their restoration. 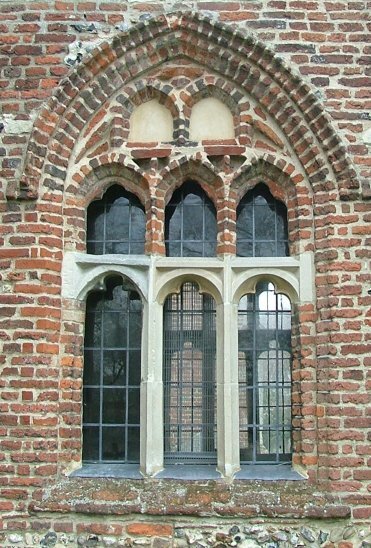 The south porch window traceries are beautiful, particularly that to the west. The older wooden north porch is rather more beautiful than useful, but is the more familiar, as it faces on to the busy main road. Above the porches rises Richard de Waldegrave's tower of the late 14th century. However, the base of the tower is a survival of an earlier one, and on its southern side is a curious tomb recess, now empty. Don't go inside without seeing the church from the east, with the red-brick Waldegrave chantry creating a very effective massing. 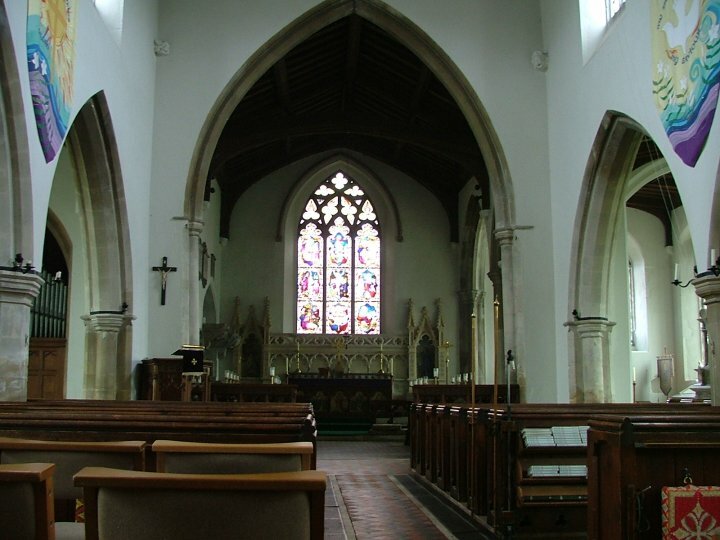 Its east window rather puts that of the chancel to shame. This is a quintessential Anglican church, its 19th and 20th century reorderings typical of thousands of large, prosperous buildings. But there are unusual things in this church, all worth going to see, and in any case I think the whole piece is done very well. The lighting scheme in particular is a great credit to the parish, who obviously care about the interior of their building being beautiful. If you look up, you will see that the ceiling consists of flat, wooden patterns, with modern lighting units set into them. Mortlock credits the woodwork to Ewan Christian, who carried out the 19th century restoration, but it looks much more recent to me, possibly 1930s. The lighting system is from the 1990s. I like the way the arcades are lit from beneath, creating the effect of an undercroft. In the sanctuary and to the north of the altar, one of the Waldegrave tombs sits grandly beside the high camp Victoriana. It has been rather battered by the fortunes of history; its brass has long gone, but the grand corbels that supported its also-vanished wooden canopy survive. 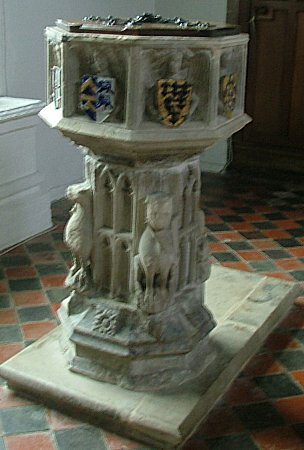 It is to Richard de Waldegrave, who built the tower, and was used as an Easter sepulchre. 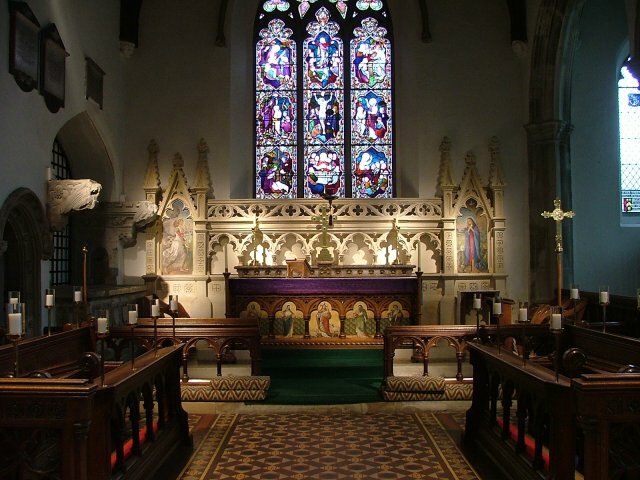 The painting of the reredos and altar is not of the highest quality (the nice Scottish lady who showed me round said she preferred it covered with a frontal) but actually it works rather well as an assemblage, and the lighting I mentioned previously works to very good effect. 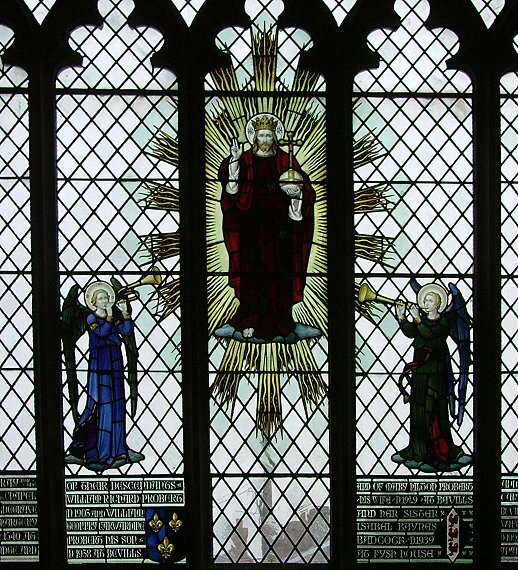 The same cannot be said of the terrible glass in the east window, poor in both design and quality. They should consider getting rid of it, before English Heritage notice it. 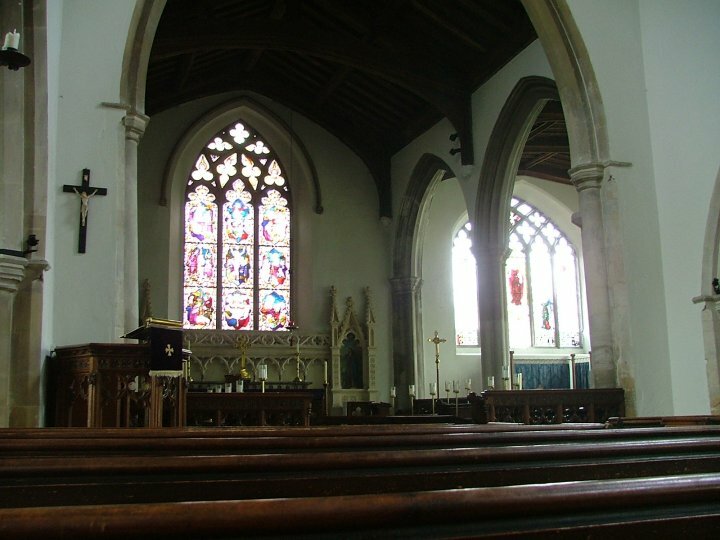 The large open space to the south of the chancel is the Waldegrave chantry. 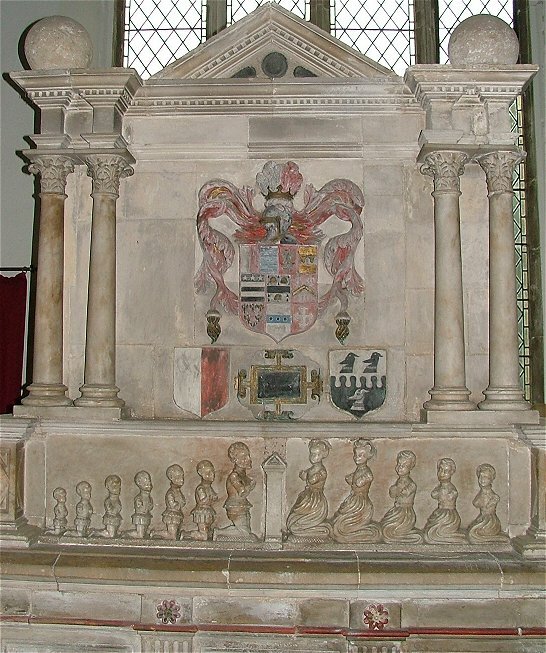 A tomb in the south east corner, actually a cobbling together of two separate Waldegrave tombs, has lost its brasses, but the standing memorial to the west is more complete, although all the little weepers have lost their praying hands. It remembers a William Waldegrave who died in the early 17th century, and the more you look at it the odder it gets. For instance, although the ten weepers are in their conventional position, there are no effigies of the remembered dead. Even odder, the memorial inscription is on the back of the tomb, and ordinarily out of sight. This memorial is curiously awkwardly placed, and feels rather in the way, until you remember that for three hundred years after the Reformation the liturgy had no need for gangways for processions, or for views of altars. The tomb was probably placed deliberately so. The Waldegraves were not popular people in this parish, apparently. 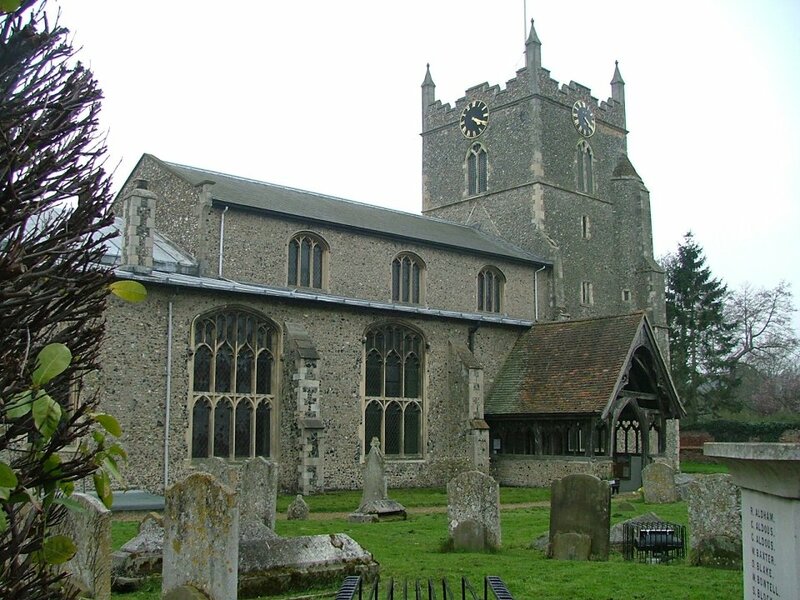 At the time of the Anglican reformers in the 1540s, there was a general uprising here and the destruction in the church was so severe that the churchwardens were punished. A hundred years later, the puritans meted out their fundamentalist justice to the Waldegrave children, removing their hands. 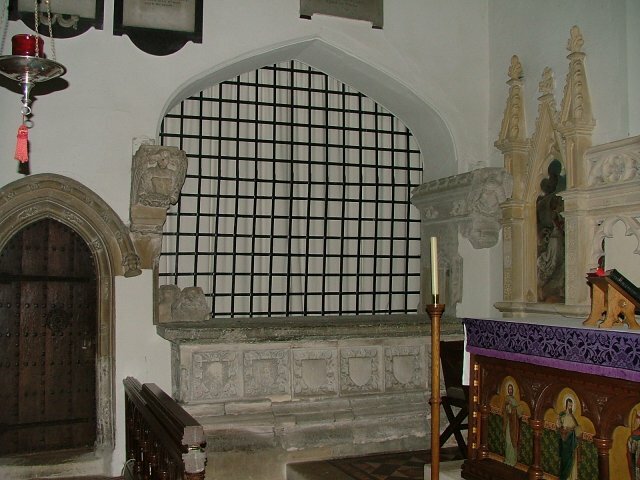 And yet, this rather ugly tomb still sits here, and who remembers the puritans now? The location of the tomb is a pity, because the eastward view in the chapel is otherwise its triumph. 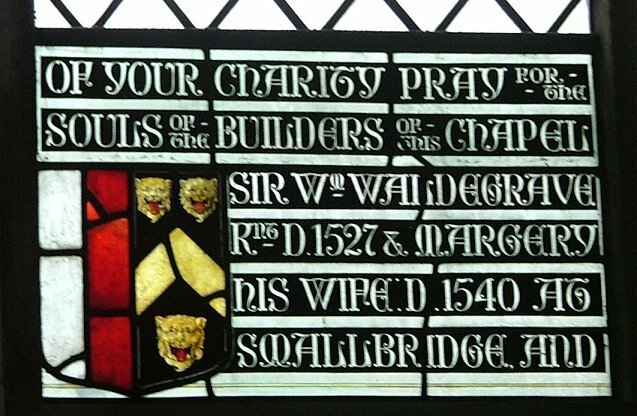 The five light window contains a modern glass memorial to the Waldegraves, including the Catholic inscription that, of our charity, we should pray for their souls. 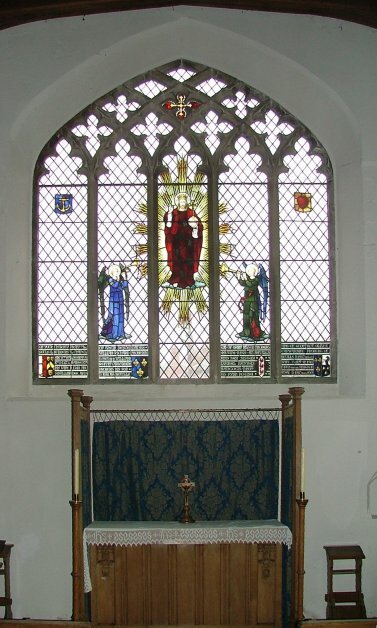 The Sarum screen backing the altar beneath is very effective. 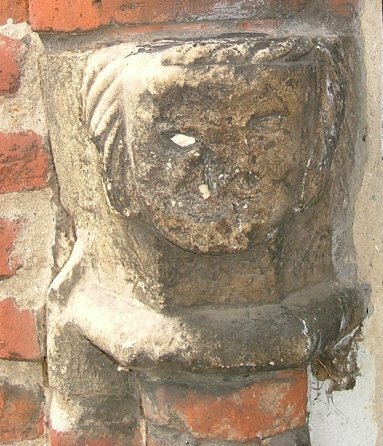 Heading back into the body of the church, a wooden effigy of a knight can be found on a north aisle window recess, which is obviously not its original place. 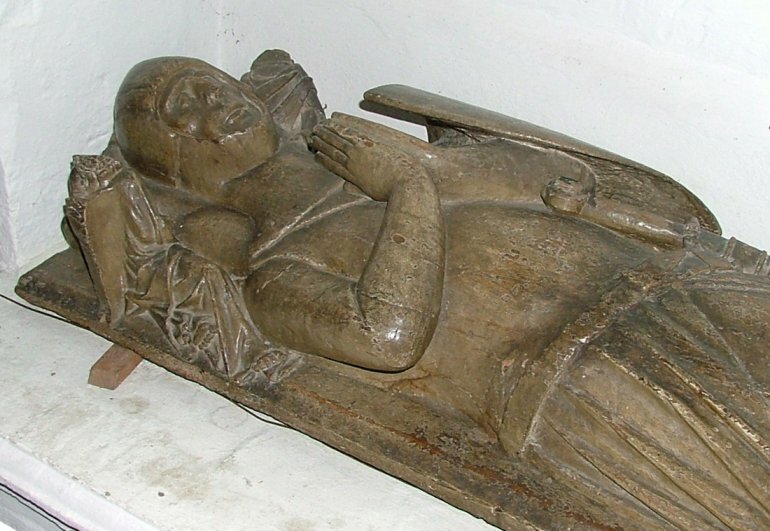 It dates from about 1330, and is made of chestnut. No one really knows who he is, although some books mention someone called Richard de Cornard, which sounds a neat Meeism. The lion under his feet has a rather sad expression, I think. 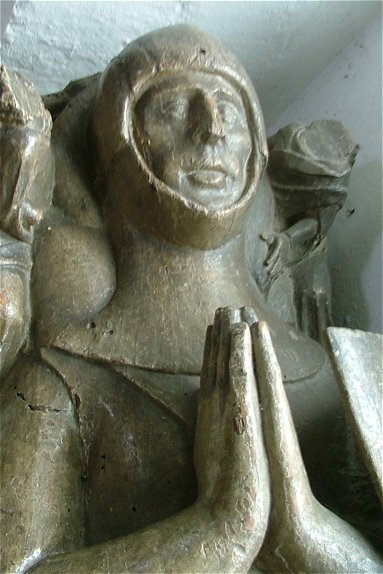 Suffolk's only other wooden medieval effigy is across the county at Heveningham. 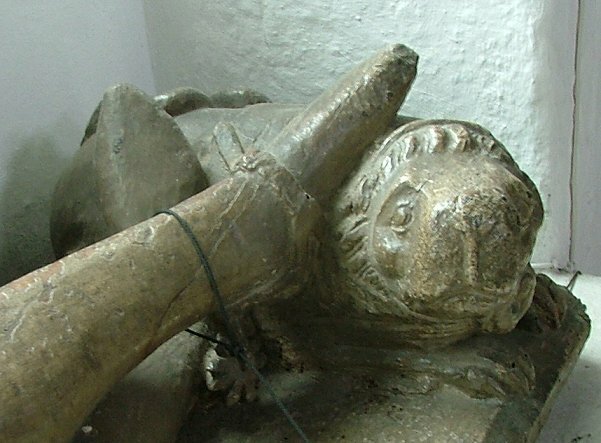 Mortlock says that the survival of his shield is notable and rare.This knight effigy may or may not have come from Bures church originally; there is no way of telling now. 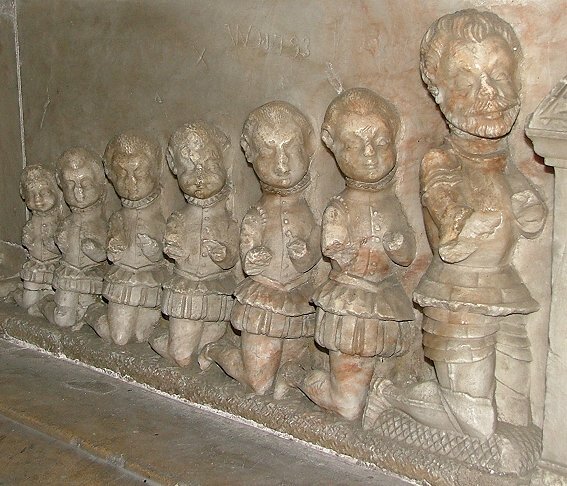 The most unusual feature of St Mary is something you would not notice, or even think to look for unless you knew it was there. 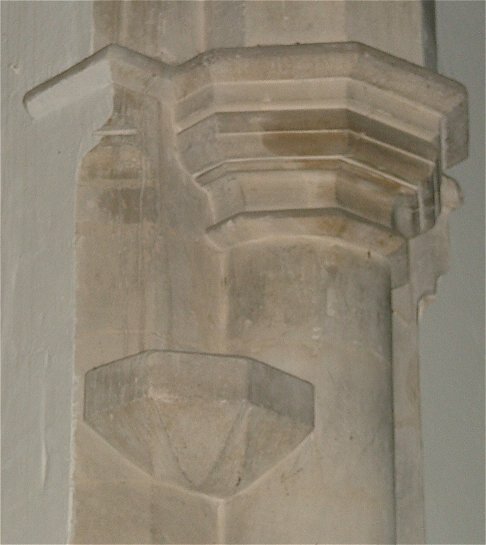 This is a strange little octagonal segment that juts out about ten feet up on the eastern face of the south side of the chancel arch. It is, of all things, a piscina. What is it doing up there? 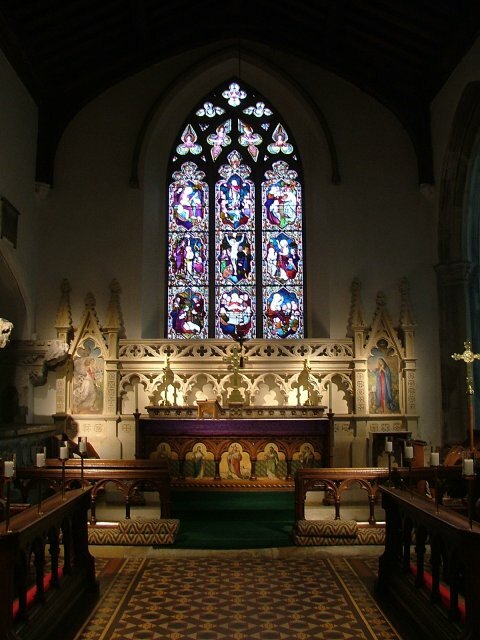 We need to imagine the rood screen, rood beam and rood loft, and all the liturgical paraphernalia of the pre-Reformation church. The rood loft here had an altar on it, and this piscina served the altar. Why is it so rare? 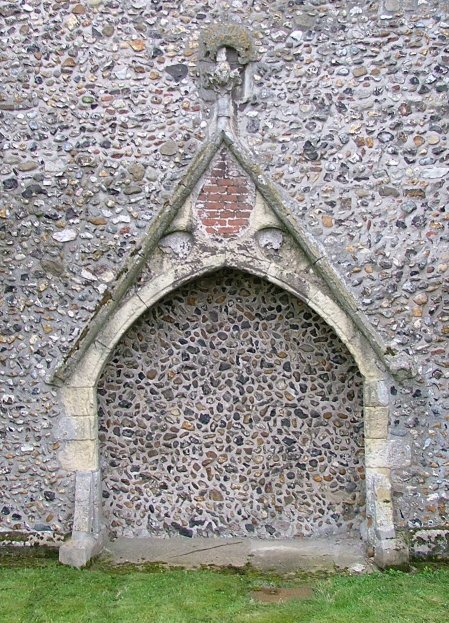 Simply, this chancel arch was built with a drain inside it. Most rood loft altars must have managed with a takeaway bowl. An extraordinary thing, in many ways. I was glad I'd seen it. Elsewhere in this large village, a medieval chapel to St Stephen has been restored from the barn it was used for for many years, and now contains fine tombs of de Veres rescued from Earls Colne Priory. I'm always conscious along the River Stour of how civilised the south of Suffolk seems, and how wild Essex looks beyond it, as if the 21st century hadn't quite made it yet along the narrow lanes from County Hall at Chelmsford. On my bike, I was tempted to head off into it, into the unknown; but knowing the glory of Wissington was near at hand on the Suffolk side of the river, I was dissuaded from defecting.